Hungary's talented WBO Light Heavyweight Champion Zsolt "Firebird" Erdei came back from the brink of defeat and stopped former world titlist Mehdi Sahnoune during a dramatic twelfth and final round on Universum's fight card from the Brandberge Arena in Halle, Germany. 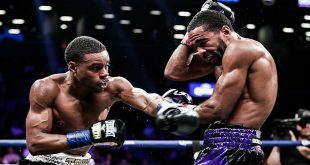 Erdei, who earned his crown by outboxing steel tough Julio Gonzalez in January of last year, found himself in deep trouble during the middle rounds when he was repeatedly beat to the punch by ex-WBA kingpin Sahnoune. 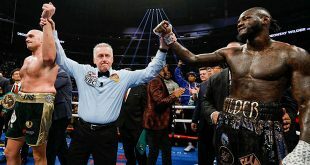 The heavyhanded Frenchman couldn't keep Erdei on the rocks however as the Hungarian fought tooth and claw to overcome his mid-fight difficulty and by the last round had backed Sahnoune into a corner and delivered such unanswered punishment that referee Joe Cortez was forced to intervene. Erdei makes his fourth title defense and moves to 23-0 (14) while Sahnoune goes to 32-2 (27). On the quality undercard, heavyweight hopeful Ruslan Chagaev remains undefeated with a fifth round knockout of ex-British title challenger Mark Krence. The Russian native canvassed Krence twice in the fourth and then for the final time one round later. Chagaev is now undefeated in nineteen bouts while Krence has now dropped three in a row. 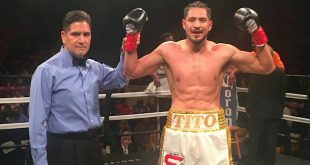 Former two time world title challenger Mario Veit kept opponent Guzmyl Perdomo at the end of his punches, eking out a majority decision against the much less experienced Venezuelan tourist over eight rounds. In a Women's WIBF Featherweight title bout, Ina Menzer convincingly upset reigning champion Silke Weickenmeier over the course of their ten round contest.